"Boulder City" redirects here. For the community in Missouri, see Boulder City, Missouri. For the hill fought over during the Korean War, see Battle of the Samichon River. The community took its name from Boulder Canyon. Boulder City is one of only two cities in Nevada that prohibits gambling (the other being Panaca). The sheer scale of the dam and duration of the project required the Bureau of Reclamation to consider the construction of a semi-permanent town rather than a temporary arrangement. Boulder City was exceptionally rare as an example of a town fully planned under government supervision. This is unlike 19th century privately funded company town examples found in the United Kingdom, such as Port Sunlight, or in the United States, such as Pullman, Chicago. Boulder City was carefully planned through federal supervision as a model community, with Dutch-born urban architect Saco Rienk de Boer contracted to plan it. DeBoer had been a planner for Denver, Colorado, and was to design many towns and suburbs around the Rocky Mountain region. Because the Hoover Dam project itself represented a focus for optimism for a country suffering from the effects of the Great Depression, the town itself was to be an additional manifestation of this optimism. There was to be an emphasis on a clean-living environment for dam workers. The plan submitted by DeBoer in 1930 was formal and symmetrical with a park and the Bureau of Reclamation building at the termination of the two main axes. The plan was deemed too expensive to carry out in its original form and was modified to allow for more regular block sizes. Nevertheless, its allowance for public space and copious amounts of landscaping earned it the moniker "Nevada's Garden City". The provision of green landscape was another expression of the Bureau of Reclamation's "mission to reclaim and 'green' the American West." The town was designed to house approximately 5,000 workers. The status of the workers on the Hoover Dam was reflected in their house sizes and locations. The most important employees had their residences on top of the hill nearer the apex. Managers were housed further down the hill, and dwellings for manual laborers were located furthest away from the public buildings and parks. The most radically modified portions of DeBoer's plan were in these lower-class residential blocks, where open space and parks were largely eliminated. Commercial development was restricted and severely regulated under Sims Ely, the city manager. There were limits to the number of different types of stores allowed in the city, and all who wished to begin a business were screened for character and financial viability. On the other hand, there was no provision for schools in the burgeoning city, probably because the Bureau of Reclamation expected that single male workers would populate the town. The town made do with makeshift schoolrooms until the city won the right for state-funded schools to be established on the federal reservation upon which Boulder City was situated. No hospitals were provided in the city either. Injured workers had to travel 33 miles (53 km) to Las Vegas Hospital, and when a hospital was established in the city, females were not admitted for a number of years. Like early model company town Port Sunlight, the workers of Boulder City were under strict monitoring: alcohol was prohibited in the town until 1969, and gambling has been prohibited since the city's outset. The city was founded during the Prohibition era. Boulder Theatre, established in 1931, meant that workers were not obliged to travel to Las Vegas for amusements. Such measures were common for company towns dating back to the 19th century, since sober workers surrounded by their own gardens and provided with appropriate entertainment would be more productive during their working days. In the case of Boulder City, the prohibition of alcohol and gambling was at least partly due to the proximity of Las Vegas, which had a notoriously rowdy vice district. Visitors to Boulder City were admitted by permit, and by 1932, there was a gatehouse through which all visitors had to pass. While the establishment of Boulder City occurred while Las Vegas was modest in size with approximately 5,000 inhabitants, it was effectively the beginning of the fragmentation of cities in the region of Clark County. This move to disperse to multiple centers predated the decentralization movement of the 1970s. The nearby city of Henderson, founded in 1943 and based around the magnesium industry, was another early example of decentralization before Clark County had a significant population: "...the region began to decentralize and regroup as a multi-centered area early in its history." 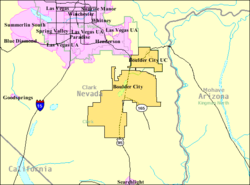 The independent governments of Henderson, North Las Vegas, Las Vegas, and Boulder City have perpetuated the fragmented nature of the region, giving each city its individual character, as well as generally stymieing the outward growth of these cities. The government did not relinquish control of Boulder City until 1959, when the town was incorporated. Boulder City's incorporation ceremony took place on January 4, 1960. The city council selected pharmacist Robert N. Broadbent as the town's first mayor. The city charter, approved by the residents, prohibited gambling within the city limits. This provision still exists, making Boulder City one of only two locations in Nevada where gambling is illegal (the other is the town of Panaca). The Hoover Dam Lodge hotel-casino, which has a Boulder City mailing address, is located on a parcel of private land within the boundaries of the Lake Mead National Recreation Area, and is not within city limits. Another casino on the other end of town is the Railroad Pass Hotel and Casino, which has a Boulder City telephone prefix, but is within the boundary of the neighboring city of Henderson. Alcohol sales were permitted in 1969. 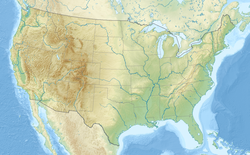 According to the United States Census Bureau, the city has a total area of 208.6 square miles (540.2 km2), of which 0.039 square miles (0.1 km2), or 0.02%, is water. This ranks Boulder City as the largest city in Nevada by land area and 35th in the country, but gives it a low density rate of only about 72 people per square mile. Boulder City maintains strict controls on growth, limited to 120 single- or multi-family residential building permits for new construction per year. Hotels are also restricted to no more than 35 rooms. These restrictions are defined in the city code of Boulder City. As of the census of 2000, there were 14,966 people, 6,385 households, and 4,277 families residing in the city. The population density was 73.9 people per square mile (28.5/km2). There were 6,979 housing units at an average density of 34.4 per square mile (13.3/km2). The racial makeup of the city was 94.54% White, 0.71% African American, 0.72% Native American, 0.71% Asian, 0.16% Pacific Islander, 1.27% from other races, and 1.88% from two or more races. Hispanic or Latino of any race were 4.34% of the population. There were 6,385 households out of which 23.6% had children under the age of 18 living with them, 55.8% were married couples living together, 7.4% had a female householder with no husband present, and 33.0% were non-families. Of all households 27.6% were made up of individuals and 13.1% had someone living alone who was 65 years of age or older. The average household size was 2.30 and the average family size was 2.79. In the city, the population was spread out with 20.4% under the age of 18, 5.3% from 18 to 24, 21.3% from 25 to 44, 29.3% from 45 to 64, and 23.7% who were 65 years of age or older. The median age was 47 years. For every 100 females, there were 97.8 males. For every 100 females age 18 and over, there were 96.0 males. The median income for a household in the city was $50,523, and the median income for a family was $60,641. Males had a median income of $42,041 versus $30,385 for females. The per capita income for the city was $29,770. About 4.7% of families and 6.7% of the population were below the poverty line, including 9.4% of those under age 18 and 5.3% of those age 65 or over. Boulder City and Lake Mead, with Hoover Dam at center right. Making a pun on the word "damn" is also popular. The Boulder City Chamber of Commerce has used the slogan "Best City By A Dam Site" in promotions, and the city hosts an annual festival of short subject films dubbed "The Dam Short Film Festival". Boulder City also hosts a number of Hoover Dam related events such as "That Dam Guy Stole My Dam Car" car race and "Get Off My Dam Lawn" gardening festival. In 1975, a team from Boulder City won the Almost Anything Goes national championship, broadcast on ABC television. The following year, they won a "Supergames" playoff against the 1976 champions from Chambersburg, Pennsylvania, and a celebrity all-star team. However, the show was cancelled soon after. The city of Boulder City is a special charter municipality which operates under the council-manager form of government. The city council comprises five members, including the mayor, who acts as presiding officer for city council meetings. The city manager is appointed by the city council and executes the policies and directives of the city council. Boulder City is one of two locations within the State of Nevada where Military Veterans and their spouses can be interred. The Southern Nevada Veterans Memorial Cemetery is located in Boulder City, Clark County, Nevada. The cemetery was established in 1990. The State of Nevada has more than 300,000 veterans and is among the fastest growing region in the Western United States of people age 65 or older with the demographic of military veterans. the 79-acre (32 ha) cemetery is approximately 30 miles southeast of Las Vegas, Nevada. Boulder City's four public schools fall under the jurisdiction of the Clark County School District. Boulder City High School serves grades nine through twelve and has an average enrollment of 700–750 students. The school colors are navy and gold. The school mascot is the eagle. The high school academic and athletic teams compete in the Nevada Interscholastic Activities Association (NIAA) 3A South Division, with the exception of the men’s and women’s swimming and diving teams. For aquatic sports, the teams compete in the NIAA 4A division. Boulder City High School was one of fourteen Clark County schools to become a five-star school in 2012. Elton and Madeline Garrett Middle School serves grades six through eight. The school colors are navy and gold. The school mascot is the bobcat. The athletic teams typically play an independent athletic schedule, mostly competing against local private schools with similar student enrollment populations. Martha P. King Elementary School serves grades three through five. The school colors are royal blue and gold. The school mascot is the cobra. Andrew J. Mitchell Elementary School serves grades K through two. The school colors are navy and white. The school mascot is the mustang. Boulder City is also home of one non-profit private religious elementary school, Grace Christian Academy, which offers a Christian education for grades kindergarten through five. The school is part of Grace Community Church. Boulder City also houses a small satellite campus of the College of Southern Nevada. Until it ceased publication in 2009, the Boulder City News was the local newspaper. Upon cessation of the Boulder City News, Stephens Media began a new local newspaper called the Boulder City Review. Desi Arnaz, Jr. (born 1953), actor musician who, with his wife, Amy, owns the Boulder Theatre, a former cinema converted into a live theatre, which is home to the Boulder City Ballet Company. Paul C. Fisher (1913–2006), inventor, politician and founder of the Fisher Spacepen Co., located in Boulder City. ^ "Boulder Dam Hotel - Boulder City, NV Lodging". ^ "Boulder City, NV - Official Website - Official Website". ^ a b "American FactFinder". U. S. Bureau of the Census. Archived from the original on 11 September 2013. Retrieved 8 July 2011. ^ Jensen, Jamie (2006). Road Trip USA: Cross-Country Adventures on America's Two-Lane Highways. Avalon Travel Publishing. p. 143. ISBN 978-1-56691-766-7. ^ Cheryl Ferrence, Around Boulder City. Arcadia Publishing, Charleston, South Carolina, 2008, p 10. ^ "Henry Kaiser"[permanent dead link]. Accessed 10 April 2011. ^ "Nevada: Landscaping of the Bureau of Reclamation Regional Office, Boulder City" Archived 2017-05-13 at the Wayback Machine. Accessed 10 April 2011. ^ "Amy Arnaz - Boulder City Ballet Company executive director". ^ "In Las Vegas, Prohibition Was Sporadically Enforced". Prohibition: An Interactive History. The Mob Museum. Retrieved 4 April 2019. ^ Shepherd, Natasha (15 May 2008). "Boulder City: A gateway to the past". Las Vegas Sun. Retrieved 8 July 2011. ^ "Geographic Identifiers: 2010 Demographic Profile Data (G001): Boulder City city, Nevada". U.S. Census Bureau, American Factfinder. Retrieved October 15, 2014. ^ Sutton, 1968. "Geographical Aspects of Construction Planning: Hoover Dam Revisted," Journal of the West, 7(3):303–344. Discussion includes the plan and the ideas of DeBoer relative to the needs of workers on the dam. ^ "Boulder City, Nevada: City Code". Sterling Codifiers. Retrieved 8 July 2011. ^ "Las Vegas Sun 14 schools earn five-star status in school district's high school ranking"
^ "2008-09 Elementary School - Southeastern Attendance Boundaries Archived 2011-09-30 at the Wayback Machine". Clark County School District. Accessed September 28, 2008. ^ "2008-09 Middle School - Northern Attendance Boundaries Archived 2011-09-30 at the Wayback Machine". Clark County School District. Accessed September 28, 2008. ^ "2008-09 High School - Southern Attendance Boundaries Archived 2011-09-30 at the Wayback Machine". Clark County School District. Accessed September 28, 2008. ^ "Boulder City Private Christian School Grace Christian Academy". Wikimedia Commons has media related to Boulder City, Nevada. Wikivoyage has a travel guide for Boulder City.